Once you have set up your environment, you can dive in and build your first Cortana skill. As you learned in the previous module, you can develop a Cortana skill on either a Mac or a PC running Windows 10 Anniversary Update (build 1607) or later, using your choice of development tools. For more information on setting up your development environment, see Set up your development environment. This module shows the basics of creating a Cortana skill using the Azure Portal and Azure Bot Service. 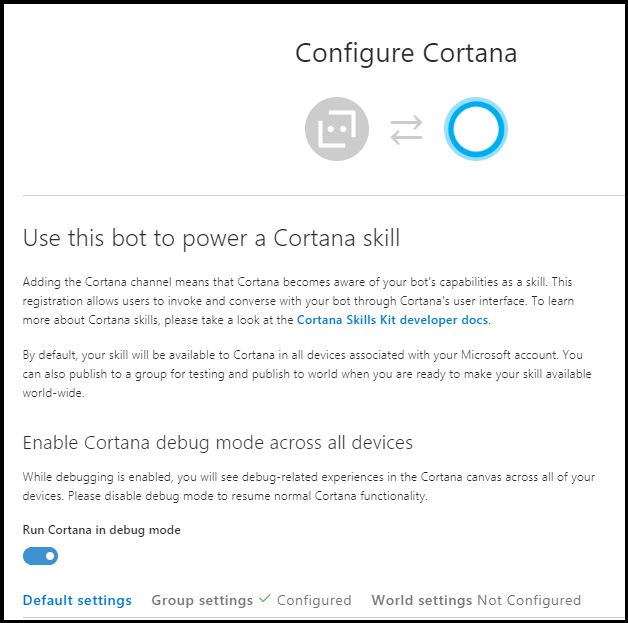 First, you'll create a bot, and then register it and connect it to the Cortana channel to make it a Cortana skill. For more information on creating your first skill, see Create your first skill. To create a bot using the Azure Bot Service, first open the Microsoft Azure Portal, log in with your Microsoft account, and then click New. 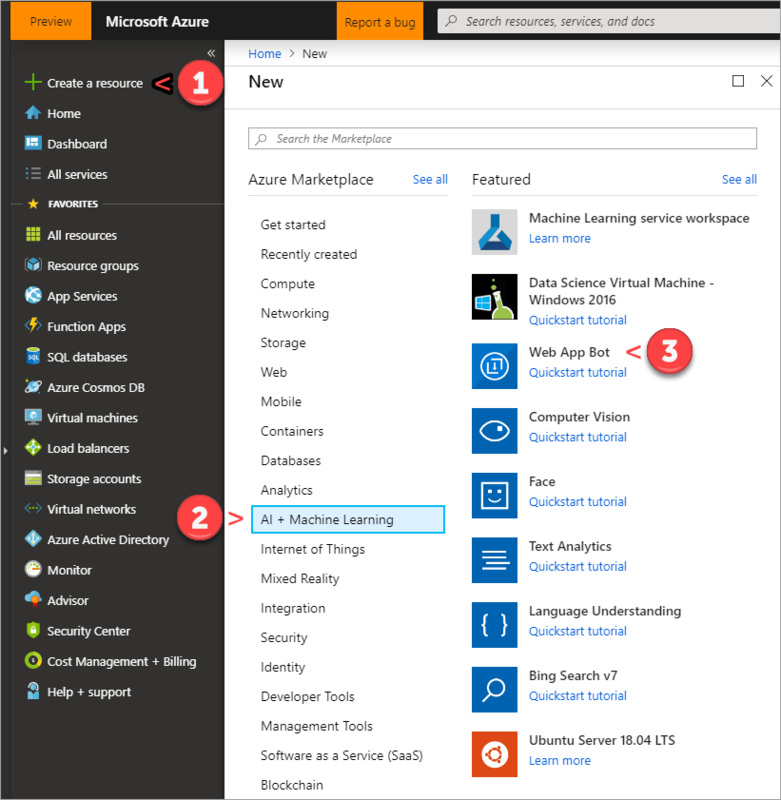 In the Azure Marketplace pane, click AI + Cognitive Services, and then Web App Bot. Enter a name for your bot. The bot service uses the bot name as the default name for the resource group name and app name. Specify your subscription plan, location, app name, and the bot template you want to use, and then click Create. 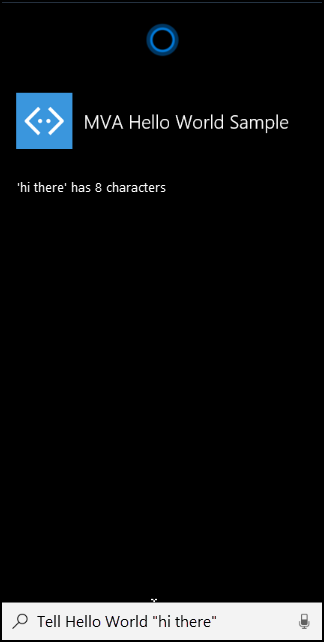 To create a simple single-dialog bot that echoes back the user input, use the Basic template. It may take a few minutes to provision and initialize your bot. When the process is complete, you can test your bot. Click Test in Web Chat to open the Test pane. Try typing something into the Type your message prompt. The bot repeats what you typed, preceded by "You said " and a count of how many messages you've typed. You can reset the count by typing reset. The mva-hello-world bot uses .NET C# code that is part of the Basic bot template. To view the code behind the bot, click Build and then Open online code editor to open the App Service Editor. The code that handles the bot's response to the message you type can be found in the MessagesController.cs and EchoDialog.cs modules. 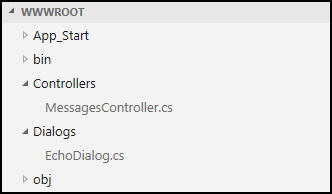 Expand the Controllers and Dialogs trees under WWWROOT in the App Service Editor to view the code. For the changes to take effect, you need to redeploy the bot. 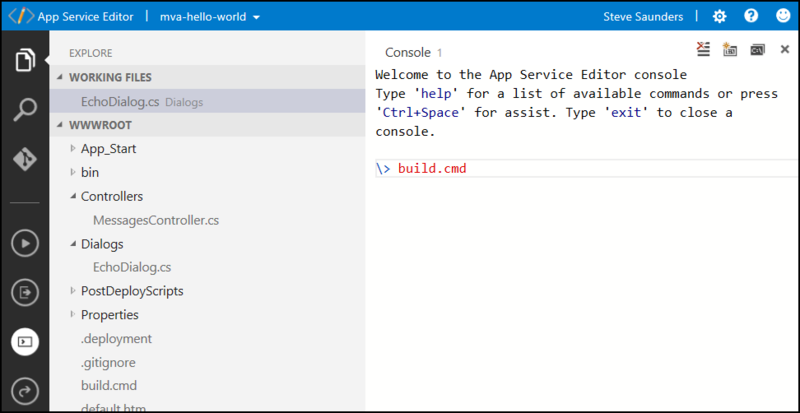 In the App Service Editor, click the Open Console icon to open the Console window, and then enter build.cmd. Once the redeployment is complete, you can return to the Test pane to test your bot. Once you have created a bot, connect it to the Cortana channel to make it a Cortana skill. 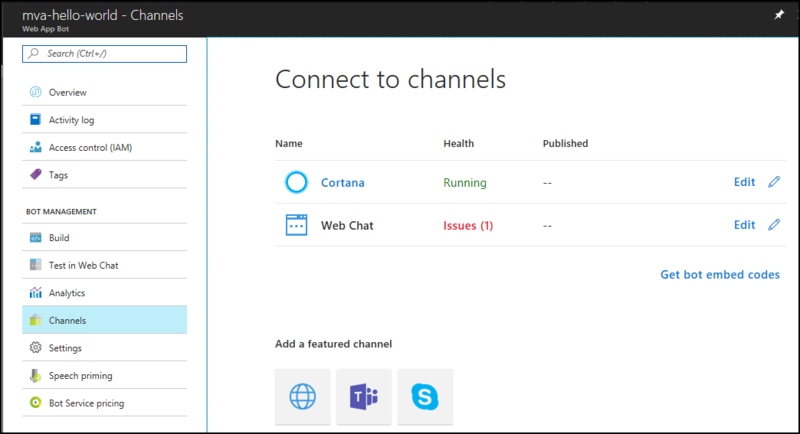 In the Azure Portal, click the Channels tab to view the available channels, and then click the Cortana channel. On the Configure Cortana page, scroll down to the Discovery and Management section and click Manage. Click the Publish menu tab and then Publish to self to open the channel configuration settings, where you can specify an optional icon for the skill, a display name, and the invocation name. Cortana uses the invocation name you specify to invoke the skill. On the Channels tab of the Azure Portal, you can now see Cortana listed as an mva-hello-world bot service channel. To return to the Configure Cortana page, where you can update the skill's configuration settings, click Edit. To test your new skill, direct Cortana to invoke the skill using the invocation name you specified; for example, "Tell Hello World 'hi there'."